Extra-time was needed to finally settle this game. Wateford's Shane Bennett is challenged by Kilkenny's Padraig Walsh. THEY LOST AN eight point advantage in normal time but Waterford steadied themselves in extra-time to finally land a knockout blow against Kilkenny in championship hurling tonight. Waterford looked to have this match completely wrapped up when Austin Gleeson clipped over the fifth point of a rousing individual performance to put them ahead 2-15 to 1-10 in the 59th minute. But Kilkenny launched an incredible recovery, as they hit 1-5 without reply. TJ Reid bundled home his second goal of the game with four minute left on the clock and it was Colin Fennelly who clipped over the levelling point in injury-time. In a frantic finale substitute Maurice Shanahan had a chance to claim glory for Waterford but his free from distance tailed wide as it finished 2-15 apiece. Yet the Lismore man made amends in extra-time. Waterford had burst out of the traps with the exceptional Jamie Barron landing a pair of points and he crowned a marvellous run in the 80th minute by lashing home their third goal. Then Shanahan fired the goal that truly killed off Kilkenny’s challenge when raising Waterford’s fourth green flag in the 83rd minute. Kilkenny died with their boots on, pushing to the line until the final whistle yet Waterford sealed a famous success with late points from Shanahan and Tommy Ryan. 33,181 supporters witnessed a game that was absorbing from the off. Waterford made all the early running to forge a 0-9 to 0-4 advantage before Kilkenny were handed a lifeline as Reid banged home a penalty after Richie Hogan was fouled. Yet Waterford finished the first half on a high note. Michael Walsh netting after the outstanding Tadhg De Búrca had launched in a delivery that Shane Bennett gathered before offloading to Walsh. Waterford’s midway advantage of 1-10 to 1-5 swelled further in the second half with Gleeson registering some magical points. When Bennett unleashed a rocket for Waterford’s second goal in the 53rd minute, they looked to be on the cusp of victory before Kilkenny reeled them in. But Derek McGrath’s charges held their nerve to finish the job in extra-time. Scorers for Waterford: Pauric Mahony 0-6 (0-5f, 0-1 ’65), Jamie Barron, Maurice Shanahan (0-3f) 1-3 each, Austin Gleeson 0-5, Shane Bennett, Michael Walsh 1-0 each, Tommy Ryan, Kevin Moran 0-2 each, Jake Dillon, Patrick Curran 0-1 each. Scorers for Kilkenny: TJ Reid 2-12 (0-10f, 0-1 ’65, 1-0 pen), Lester Ryan 0-3, Richie Leahy 0-2, Richie Hogan, Eoin Murphy (0-1f), Colin Fennelly, Ger Aylward, Kevin Kelly 0-1 each. Email “Waterford end Kilkenny hoodoo with first win over Cats in championship since 1959”. 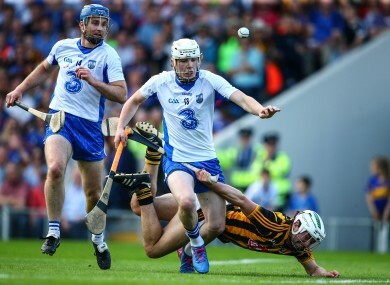 Feedback on “Waterford end Kilkenny hoodoo with first win over Cats in championship since 1959”.